DialANerd Planet Head Quarters is the basement of Pete's home. (Nerds are always religated to work in the basement). Rivers Edge Road is the first right turn off of RTE 29 just 800 yards South of RTE 32. It is the only traffic light between Columbia and Montgomery county. 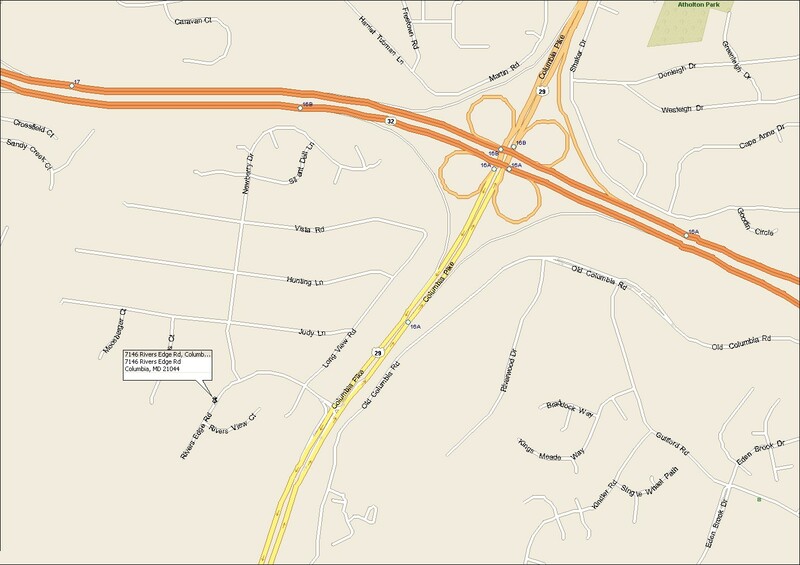 If you pass Johns Hopkins Road or RTE 216 you have traveled too far South and missed the turn. Once you are on Rivers Edge Road, you travel straight back. You will pass through a STOP sign and go up over a small hill. As you start down the hill, a street (Newberry Drive) runs off to your right. There is a corner house on the right, and then Pete's is the second house on the right after the corner house. The number again is 7146 Rivers Edge Road. When you go to the front door, there is a button on the right that causes all the telephones in the house to ring. Regardless of where we are on the house, we can get the phones and then meet you. Please see the map below for further information. Map locating DialANerd Planet Headquarters. Dial-A-Nerd is a local Columbia, Howard County, Maryland small business specializing in Personal Computer (PC) repair, hard disk data recovery, laptop repair, network configuration and repair. DialANerd troubleshoots, repairs, removes viruses, and recovers data on Windows 9x/Me, Windows XP, Windows Vista, and Windows 7 PCs. 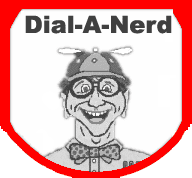 Dial-A-Nerd works on Linux servers, develops web sites, performs virus removal, and more. DialANerd is available 24 hours a day 7 days a week. Dial-A-Nerd provides immediate remote access service as well as fixed price service charges for drop off and pick up service at our repair shop with typical 24-hour to 48-hour repair completion. PCs are tested and diagnosed for free at our repair shop. The Dial A Nerd goal is to save your data. We test your disk at no charge for errors and damage every time we service your PC and we save data from damaged disks in about a 90% of the PCs we service. DialANerd is a local Columbia Howard County repair business with 30 years of experience that gives you faster service and better customer support than any Geeks or other franchise PC repair companies. Contact us for your business service solution. Dial A Nerd works on all types of PCs including Sony, Gateway, Hewlett Packard, Compaq, Toshiba, Emachines, Clone PCs, and Dell computers in Columbia, Ellicott City, Howard County and many other Maryland locations. The Dial-A-Nerd mission is providing the best quality, affordable cost effective computer repair, home PC support, training, virus removal, printer support, SOHO network - wireless (Wi-Fi) network setup, web site design, promotion, and optimization services to any home or any small business operating with limited IT services and IT support budget. ï¿½ 2004-2013 by P. D. Moulton. All rights reserved.